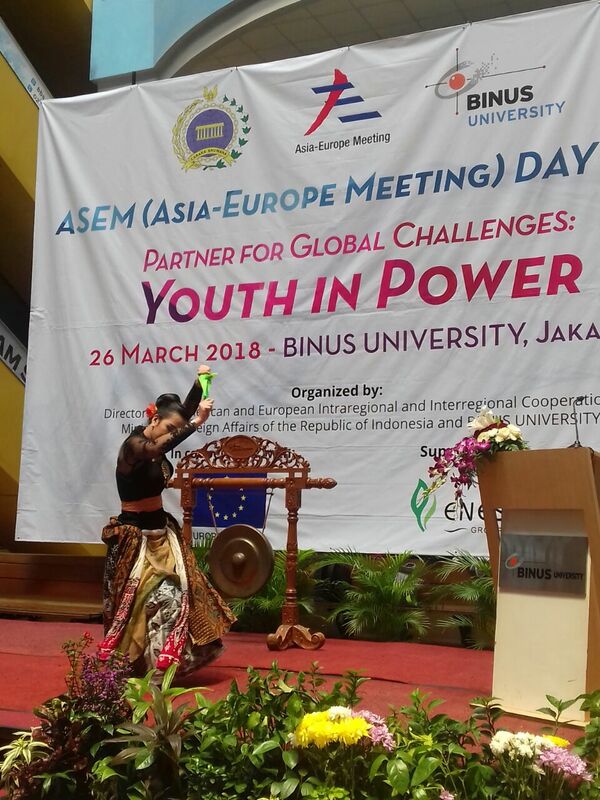 On 26 March 2018, The ASEM (Asia-Europe Meeting) Day 2018 with the theme “Partner for Global Challenges: Youth in Power” was held in Binus University along with its partners, the Directorate of American and European Intraregional and Interregional Cooperation, also the Ministry of Foreign Affairs of the Republic of Indonesia. One of the agenda of ASEM day was the talk show which took place in Aula 800, 8th Floor Anggrek Campus, Binus University from 1.30 – 3.30 pm. 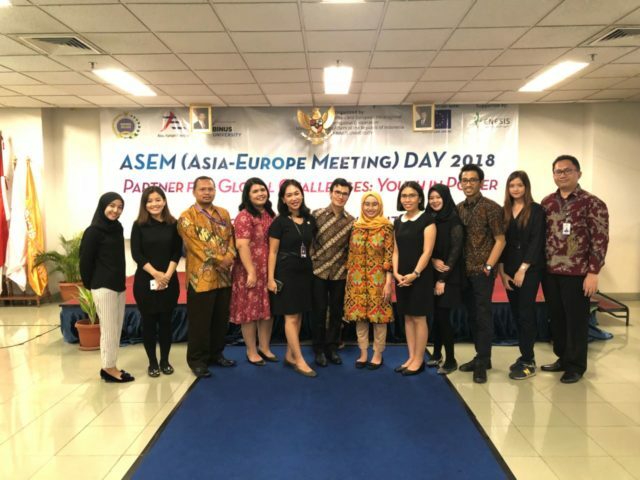 This event was attended by H.E Mr. Karsten Warnecke as the Executive Director of Asia Europe Foundation, H.E Mr. Vincent Guerend as the Ambassador of the European Union to Indonesia and Brunei Darussalam, also George Junior Geraldy, the Second Secretary of Ministry of Foreign Affairs of Republic of Indonesia. As part of the effort to voice out youth’s voice in facing global challenges, the event also invited one of youth’s representative from Binus University, Kartika, who previously has won Most Outstanding Student 2017 awarded by Kopertis III DKI Jakarta to share her opinion in regards to youth’s perspective in facing global challenges. The event addresses various topics, including global warming, terrorism, poverty, education, religion, etc. Each speaker highlighted different issues which they considered as global challenges, however all agrees that youth needs to be given more opportunity to be involved in policy making and program development since they are the future leaders in facing these global challenges. ASEM as an informal dialogue platform where head of states gathered to discuss issues of common interest between Asia and Europe, and due to its informality nature, no binding laws or resolutions are adopted; however, more voices can be heard and therefore more opportunities will be given to youth to address the issues. 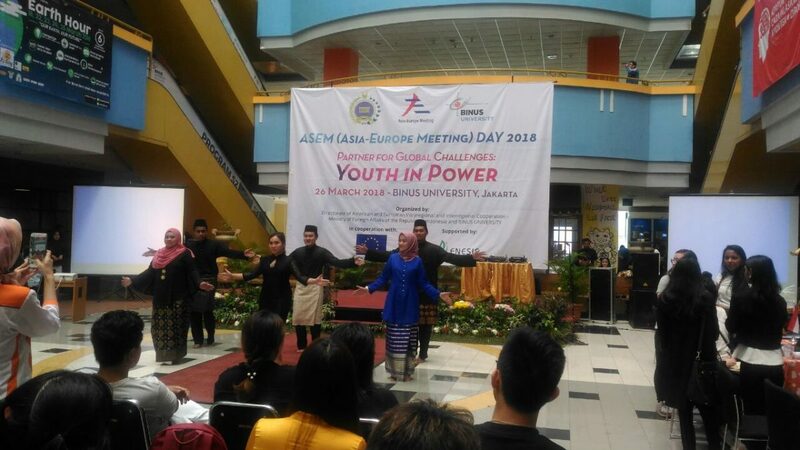 ASEM has provided various youth programs such as Model ASEM. 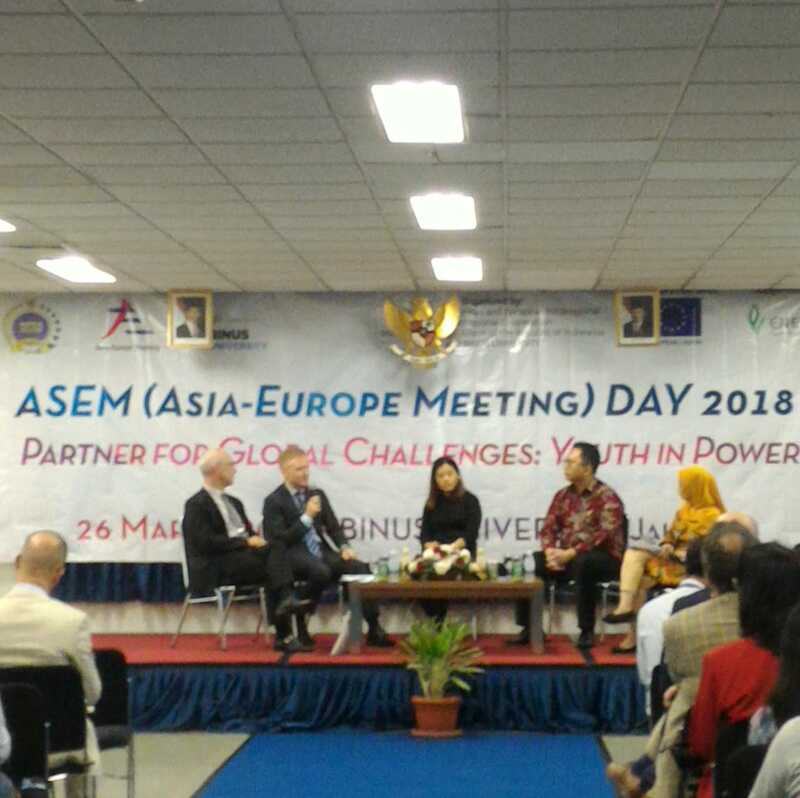 Mr. Vincent Guerend and Mr. Karsten Warnecke calls out youth to engage more in ASEM programs, also to actively contribute their thoughts and discuss them together with policymakers from all around the world. In response to it, Kartika representing the youth voice thinks that many of young people today are still apathetic towards social issues surrounding them. Lack of sense of belonging towards their own community and nation is one of the biggest challenge that needs to be tackled first before having youth to contribute proactively. George Junior Geraldy on behalf of the Ministry of Foreign Affairs stated its appreciation towards ASEM for it has made many positive capacity building youth programs possible. At the end of the talk show, all speakers spoke out their opinions on how global challenges can be tackled by mutual cooperation between the government and society, including youth to proactively engage in generating ideas for policy formulation in facing the global challenges.